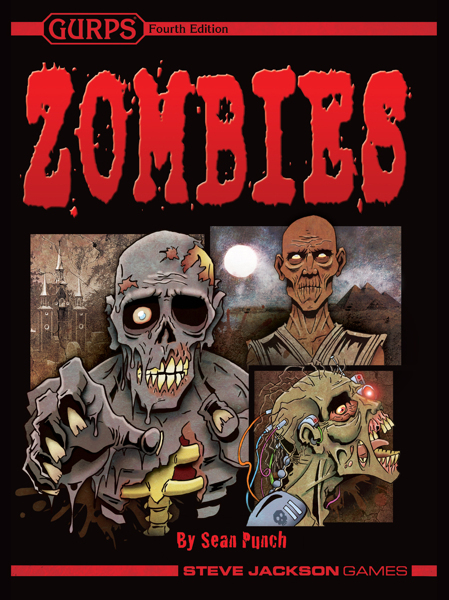 Daily Illuminator: The (GURPS) Zombies Are Coming! 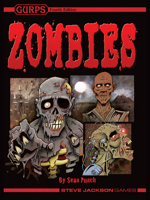 October 23, 2013: The (GURPS) Zombies Are Coming! You know you love them. The living dead are an enduring myth in our culture, a personification of the collapse of society. Plus, they're just so fun to kill. Now you'll be able to add them to your GURPS game, in a fantastic new hardcover supplement! GURPS Zombies contains everything you need to chop down zombies by the dozens in your own GURPS game. A rules-free survey of zombies by fictional and folkloric origin, physical and supernatural type, and dramatic role. Systematic guidelines for creating custom zombies to surprise your players. Ready-to-use examples for the zombie-master in a rush: B-movie and fantasy undead, living-but-infected crazies, necromancers' pets, science experiments gone horribly wrong, surgical constructs gone disturbingly right, and many others. Rules for topics dear to the zombie-lover's heart: horde management, splatter and contagion, cures, and even inventing new kinds of zombies! Information for those who must confront zombies, including gear recommendations, rules for avoiding infection and simply surviving, and templates for survivors, zombie-hunters, and zombie-makers. Advice on using all this in any genre. Who says zombies are only for horror? What more could you ask for? Oh, you want it now? Well, fine then. If you don't want to wait until December 2nd for the hardcover book to come out, you can buy the PDF right now! Happy early Halloween.